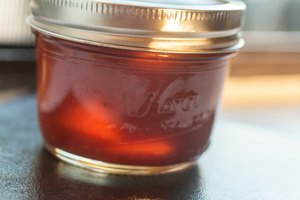 Pasteurizing food in jars, commonly called “canning”, is a popular way to store food without refrigeration. Pasteurizing is effective as a method of sterilizing food because bacteria cannot survive when exposed to temperatures above 180 degrees Fahrenheit for an extended period of time. 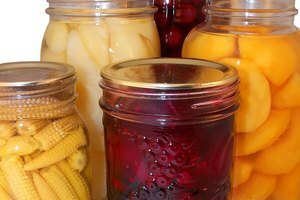 Many foods including vegetables, picked products, jellies and meats can be safely stored by canning. Determine if your food is high-acid or low-acid. 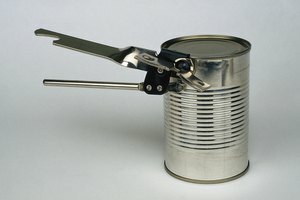 High-acid foods can be canned using a hot water bath, whereas low-acid foods require a pressure canner. You can test the pH using litmus paper and increase the acidity by adding lemon juice. A low-pH indicates a high-acid food. Clean and sterilize your jars. In order to sterilize your jars, place them right side up in your boiler, cover with water and boil for at least 10 minutes. Simmer your lids in a separate pot. Fill your boiler with water and insert the rack. Turn on the burner to begin pre-heating the water. Fill the empty jars with food. Depending on what you are canning you will use a hot pack - filling jars with hot food - or a raw pack - filling jars with raw food, such as green beans, and boiling water. Remove air bubbles from jars using a non-metallic spoon or spatula and stirring the contents of the jar. Top off the jars after all air bubbles have been removed. Clean the mouth of the jar using a wet paper towel. Be sure that there is nothing on the mouth of the jar that will prevent the lid from sealing. Apply the pre-heated lid and screw on the ring as recommended by the jar's manufacturer. A lid that is too loose may allow food to leak, whereas a lid that is too tight may lead to broken jars. Place the jar into the boiler using a canning jar lifter. Repeat this process until your canning rack is full. Process your jars for the recommended amount of time. High-acid foods in a hot water bath are heated to a rolling boil (212 degrees Fahrenheit) before the time begins. Low-acid foods in a pressure canner are heated to between 240 and 250 degrees Fahrenheit and 10 pounds pressure before processing time begins. Remove jars from hot water bath immediately and let cool for 12 hours. Pressure canners should be allowed to cool and should not be opened until the pressure gauge has returned to zero. In order for the pressure gauge to function properly, pressurized canners must be vented (by boiling for 10 minutes thus forcing all air to escape) prior to sealing. 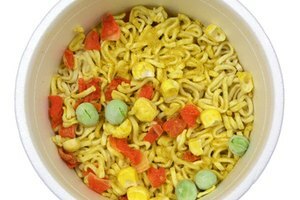 Botulism is a rare food poisoning cased by the bacterium Clostridium botulinium and it can be fatal. Be sure to use the correct method and processing time for the food you are pasteurizing. 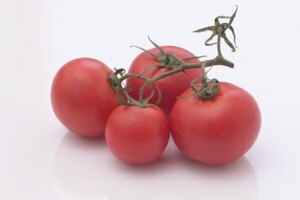 PickYourOwn.org: Why do I need to use a canner? Based in San Diego, Wesley Davis has been writing and editing since receiving a grant from the National Geographic Foundation in 2005 to publish a children's science book. He now writes for Limelight Education. Davis holds a Bachelor of Science in biology from California State University-Chico.